We are extremely excited to welcome GRIN – the second implementation of MimbleWimble protocol – to our cryptocurrency family after BEAM. With characteristics of privacy and scalability, GRIN is expected to be a highly popular cryptocurrency for our GPU miners. Mining equipment: Support GPU mining (N-card, A-card, at least 4G RAM). Operating system: Windows and Linux. Mac is currently not supported. Miner Master (NVIDIA, at least 4G RAM). GRIN requires a username to mine. Therefore an f2pool account is required. If you don’t have one, please click here to register. 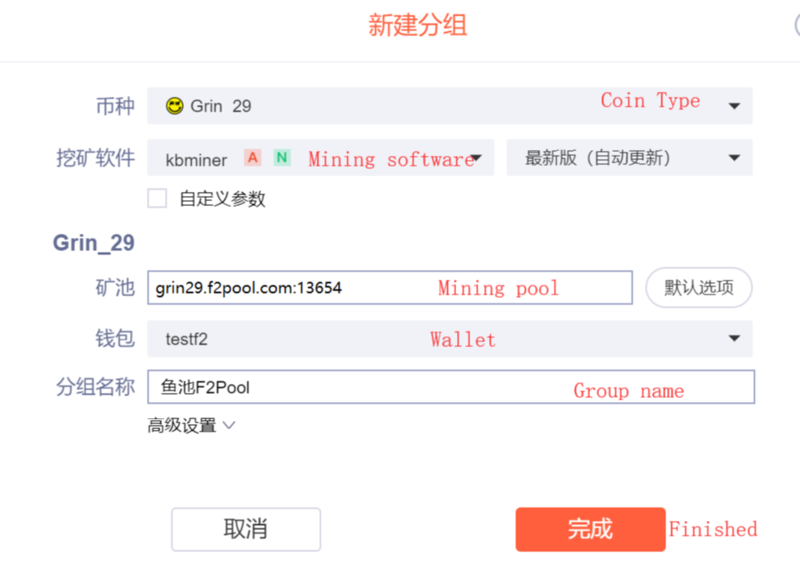 Once you have an f2pool account, you can start mining GRIN and the mining revenue will be automatically accumulated in your account. If you want to withdraw coins, please login directly to your f2pool account and add GRIN coin information in account settings. Please note that GRIN doesn’t have a wallet address. All of the transactions will take place through the full node wallet. Currently, only the Linux version can be officially used, which is quite complicated to use. Click here for more details. Last but not least, you can also obtain an URL from an exchange platform to receive the payouts. BitMesh exchange already supports GRIN transaction. Click here for more details. The official mining software requires miners to create a batch file and configure it with the following parameters. Grin’s official software is low in computational power and the operation is relatively complicated. It is not recommended. The following is a description of Miner Master mining. After logging in to the official website, click “下载单机挖矿安装包” (Download Single Machine Installation Package) to download the latest v1.6.0 version. After the download is complete, run the installation program to finish the installation. Set the worker number to distinguish between different miners, which can be a combination of numbers or letters. 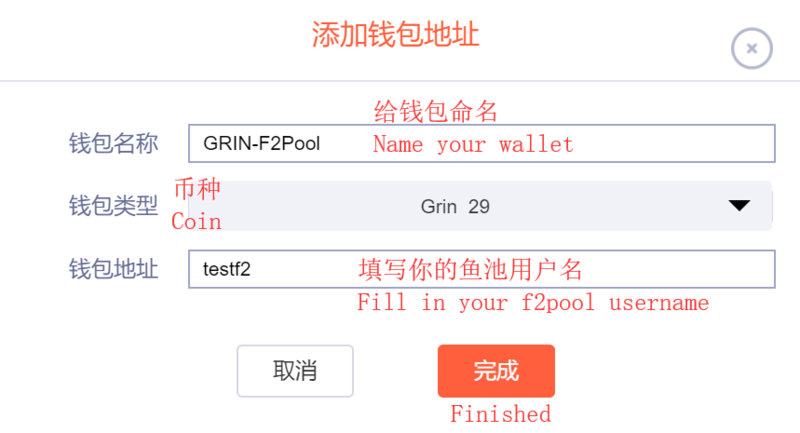 GRIN wallet: Fill in your f2pool username. Once the setting is completed, click on “开始挖矿” to start mining. Download the Bminer mining software and unzip the files. Right click on “start.bat” and click “Edit”. Set the GRIN pool URL and port number, and set your own f2pool username and worker name as shown in the image above. If you have multiple miners, the worker name is used to distinguish between different machines. The wallet address and worker name should be separated by a period “.”. First, you would need to make a boot disk with an USB flash drive or mobile hard disk with more than 16G memory. Click here for the tutorial. Mining system requires version V 4.11 or above. In the left navigation bar, click “分组” and then “新建分组” to create a new group. In the “新建分组” section, choose coin type based on your GPU model (GRIN 29 supports 4G RAM and above, GRIN 31 supports 8G RAM and above). In the “钱包” textbox, choose the wallet, which is already set up in the section above. If the GRIN hashrate can be observed on the mining machine page, it means that mining has been started. 1. For miners who have not installed minerOS, first register a minerOS account (HERE). Miners who have already installed minerOS can skip the installation and upgrade to the latest version. 2. Prepare a 16 GB (or larger) U disk or mobile hard disk, click here to download and set up to V1.1.6 version (or above). 3. After the download is complete, burn minerOS to a USB flash drive or mobile hard disk. For N-card, choose the version 1.6.6D410 and above and for A-card, choose version 1.7.0 and above. 4. Insert the burned U disk or mobile hard disk into the mining machine. After the machine is turned on, it will automatically activate the minerOS account, which has just been registered. You can log in via minerOS to operate the mining machine. Please note: This is a simplified installation process. For more details, please refer to the “minerOS installation tutorial”. The version of the engraving tool in this tutorial is too low, please do not download it. 1. Set up a new miner template. In the left navigation bar, click on “Drilling Template” and click on the blue “+” icon on the right side. A-card: 474 574 484 584 and other 4G cards can be tested here to see if it works but C31 is not recommended. A-card: 578 588 vega56 vega64 (vega requires a customized version). 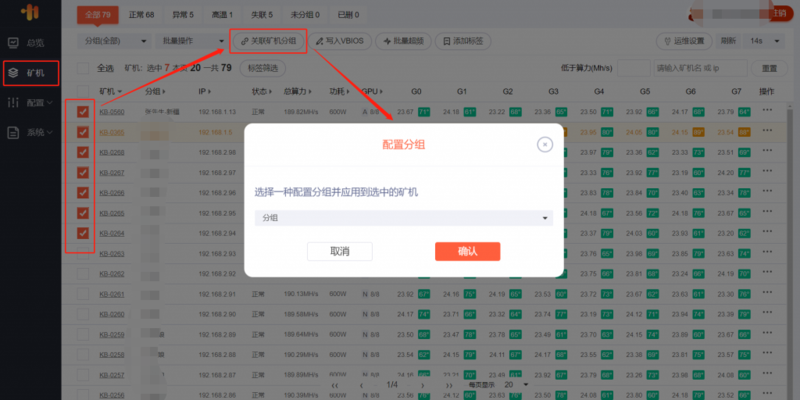 Click “主机” in the left navigation bar, find the miner to be configured, in the “操作”, click “配置并重启” (Configure and restart), go to the next page, select the mining template just created, click “确定” and “是” in the pop-up box to confirm. After the configuration is completed, the mining starts. 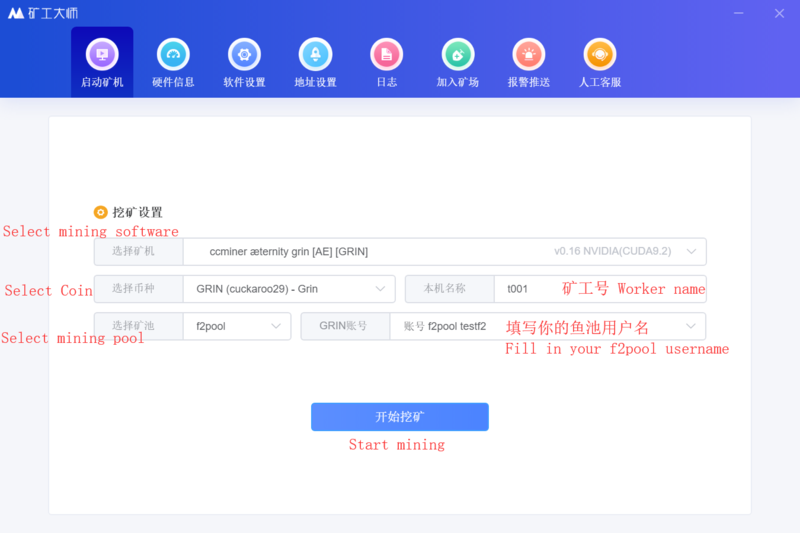 To view the operational status and daily income of the mining machine, you can login the f2pool official website, click on the iconin the upper right corner to switch to Grin, and you can check all the mining details. You can also view the information through our f2pool app..